There may be times when you want your participants to repeat an assessment – for instance if they fail a quiz or you just want to give them the chance to try an assessment over again regardless of their score. It’s easy to do either of these things in Questionmark Perception. 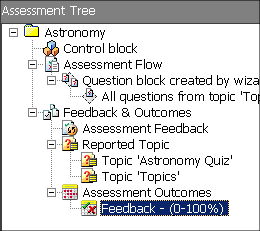 The ability to branch assessments is particularly helpful if you intend to embed them in a web page like SharePoint, blog or wiki. When creating or editing the assessment, check the Enable pass / fail check-box in the Assessment Feedback screen of the Assessment wizard and set the required pass % mark. Just choose the assessment you are currently editing, so that participants will automatically repeat it if they do not achieve the passing score. When creating the assessment, ensure that there is only one assessment outcome for any score from 0 to 100%. To do this, uncheck the Enable pass / fail check-box on the Assessment Feedback screen. Follow the same instructions as above to indicate that you want participants to branch to the assessment you are currently editing. That way, they can be taken back to the assessment for another try.